A Greater Date: Country Personals, Rural Dating & more! Country Personals, Rural Dating & More! Country Passions is a free dating site for rural singles. Join for free & take advantage of free email, chat, forums & more. Looking for your gay cowboy? Rural Gay Dating is a site specifically for country western gay guys, & gay rodeo lovers. Join for free & start browsing the country lovin guys online right now. Niche dating has exploded online, providing sites that are exclusively focused on one particular group of people (and the people who are interested in that group). 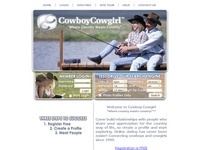 If you are interested in the Cowboy community, Cowboy Dating Connexion is the site for you. It only takes minutes to create a free account, and then you are free to check out the singles who have also been drawn to this site. You can't meet someone just by looking at the homepage, so join...and start having fun! "A Community of Country Friendships from finding a team roping partner, riding partner or just a �friend who loves the same country interests as you do.� Join now to be a part of one of the fastest growing Country networks!" "We have thousands of conscious / holistic / spiritual members with profiles, including in-depth essay questions and up to 4 pictures. Join online members in the chat room. Meet other members LIVE at our interactive events and enjoy articles and tips from conscious relationship coaches!"